Billboard covered the re/code event last week to report that Susan Wojcicki, CEO of YouTube, announced that they are ‘Optimistic’ that YouTube’s streaming service will be launching ‘Soon’. Additionally, an interesting kernel I took away from the article reports that over 50% of YouTube traffic is now coming via mobile devices…that seems like a good reason to make sure one’s global platform policy within Content ID is set to include mobile viewing, which will include distribution on handhelds, console devices (xbox), and TV’s. SoundCloud has just announced a streaming service to be launched in early 2015, to compete with Spotify, Pandora, and others. It has been reported that Warner Music Group has taken a small stake (3-5%) in the company. Techcrunch covered the announcement here, which includes Warner’s official press release. SoundCloud also recently launched an effort to allow playing their content on Twitter. The feature is available to limited creators, including This American Life , NASA, and David Guetta, however they report that it will be opened to everyone soon. The idea is that when you put a bunch of really talented and creative people in the same room, collaborations coalesce and good things happen. We heard an excellent talk on the creative process from one of the most talented animators in world, Chris Kelley, and followed up with a dynamic conversation including contributions to his perspective and take aways. Start the day with creatives and a coffee. by LA Hacker News. Very limited seating. If you’ve not visited the YouTube Space LA before, it certainly is beautiful and exceptionally well equipped. You might find it to be a resource, either for yourself and/or the artists you represent. Did we mention it is free? For what it is worth, Rene (Co-founder & COO), is the music publishing expert here at Exploration, while I (Co-founder & CEO) architect our software. Additionally, we are joined by an incredibly talented group of software engineers, licensing coordinators, and one incredibly handsome dog. 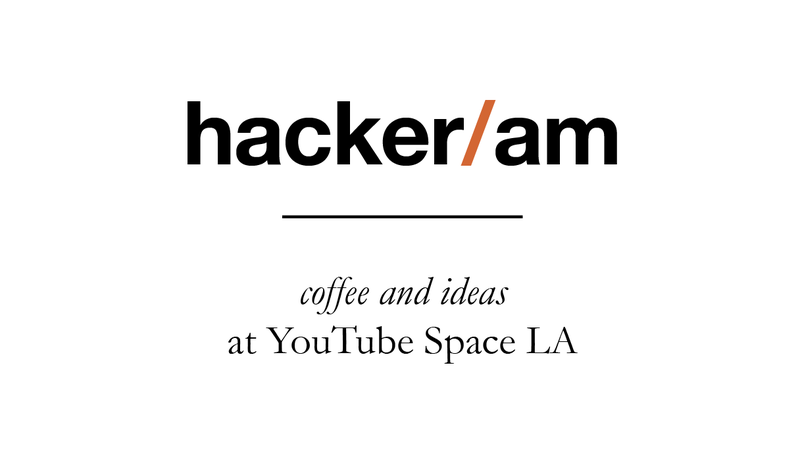 Inasmuch, I have been involved with the Los Angeles Hacker News Meetup for several years and took over as organizer about 2 years ago, as I really enjoy the community and appreciate growing my ability to build powerful software. The group is a local meetup for folks passionate about reading Hacker News, the community forum of Y Combinator, which is the funding company behind Airbnb, Dropbox, Reddit, and over 700 other companies. The site is the preeminent destination at the intersection of technology and entrepreneurship. The meetup focuses on how software and business can change the world we live in and make an impact. We share projects we are working on, discuss ideas that are important, and support each other to put our best foot forward. We typically connect in the evenings, of course hacker / am is an exception. Please do visit if you are ever nearby. Attendance and refreshments are always free. This wednesday night will have the music executives of Los Angeles making a hard choices. Both are free and should be filled to the brim with solid music and those you want to know in the biz. ps – Copyright on YouTube can often times be a lot to manage, and that’s just for us earthly beings. What if there were extra-terrestrial concerns to worry about as well? 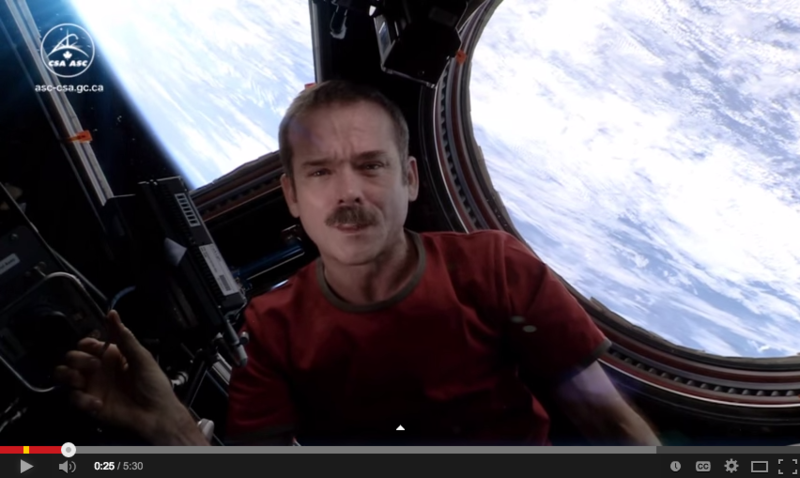 Really happy to report that Commander Chris Hadfield’s Space Oddity, filmed in space from the International Space Station, is now back on YouTube for viewing, as of yesterday.